When most of us think of worms, we cringe as we picture slimy, wiggling creatures that we would much rather avoid! However, a new study has suggested that worms may be one way to fight allergies such as hay fever. Although the concept may seem odd when you first consider it as a hay fever treatment, research has been surprisingly positive in terms of how effective certain worms are for helping hay fever. This interesting study didn't just focus on any worms. Instead, it looked at gut parasites. 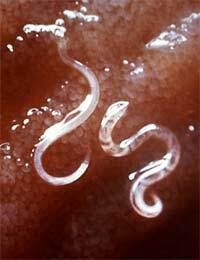 Gut parasites include parasites such as hookworm, which have lived in their human hosts for millions of years. The parasites are considered 'intelligent' in that they have evolved by finding ways to continue their survival in the human gut. To do so, these parasites will find ways to subdue the human gut's immune response to their presence. In this way, they can live and ultimately, survive for a longer period of time in the human host's gut. Yet, this precise way in which a parasite such as the hookworm reduces the immune response in humans could be the key to understanding how a reduced immune response might also influence allergic reactions – in tissues – that occur in hay fever and other allergies. In this particular study, researchers initially looked at links between worms and allergies in Vietnamese children. They found that the children who had the highest levels of hookworms were less likely to suffer from indoor allergies to dust mites. This link supports the 'hygiene theory' and lends credibility to the belief that being infested with hookworms can potentially protect a person against allergies. Given that developed nations such as the United Kingdom have such high rates of allergies, this research suggests that our immune systems are not as strong when conditions of extreme cleanliness are present. These conditions can mean that we aren't exposed to bacteria, viruses or parasites, all of which – depending on the organism and conditions – could improve our immunity and reduce the prevalence of allergies such as hay fever. This kind of study provides important clues about the causes and triggers of hay fever and other allergies. In fact, another study is currently looking at how an intervention to reduce or remove the worms can influence allergies such as hay fever. It is hoped that further studies can provide more conclusive evidence of any link. In this way, if worms do indeed provide protection, we can look at how we may safely reduce a person's immune response to allergens, which could lead to preventing and successfully treating hay fever and other allergies. In fact, drugs that may be developed in the future could work to reduce hay fever symptoms by mimicking the immune effects of the hookworm. Although there are many effective hay fever treatments currently on the market, the sheer number of sufferers means that treatments simply won't work for everyone. For those who suffer from hay fever quite severely and regularly, it can be disheartening when treatments don't work. Hopefully, the new study can soon provide a firmer link and subsequently, introduce new treatments for hay fever sufferers.